It's a pleasure to welcome Alicia Quigley and a post on the Little Ice Age and fashion! 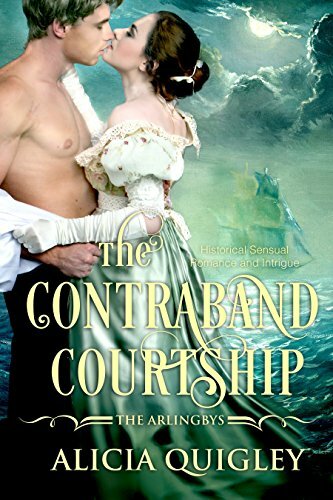 I'm pleased to announce that Terrylee Warren is the winner of The Contraband Courtship giveaway. Congratulations! For most of human history, home heating was a rare luxury, and the temperature of human indoor spaces followed that of outdoor spaces far more closely than today. As a result, clothing styles through the ages can tell us something about climate, as well as society. As you can tell from the title, this post is about the traces that weather in Europe left in women’s fashions in particular, and especially in Georgian and Regency times. I don’t claim that this is observable over periods shorter than 20 years or so, but I do think that some interesting clothing changes in this period can be attributed at least partially to weather. The little Ice Age ran from roughly 1300 to 1880. Since home heating and lighting started to develop rapidly in the mid-19th century, particularly for the better off (which is the group at whom fashion is targeted) effects of weather start to become less important in the second half of Victoria’s reign. The picture to left shows the kinds of temperature changes Europe experienced during this millennium, during which the Medieval Warm Period of the halcyon “Merry Olde England” variety came to an end, and an era of much more variable, unpredictable and colder weather prevailed. Looking at some broad impacts this had on fashion in the early middle ages, we can compare the bliaut, which was the common base garment of both ladies and gentlemen in much of the 11th and 12th centuries (the late Medieval warm period), with the houppelande, a garment similarly common for both men and women during the early part of the Little Ice Age. The bliaut was a garment made of linen, silk or wool fabric thin and soft enough to fall in folds very close to the body, as you can see in the pictures. 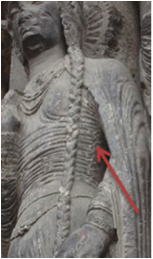 It was tight laced, or possibly pieced or smocked to achieve the tight folds across the torso. It was often shown with a cape, but there are many pictures of them being worn on their own, a clear indicator of warm temperatures. The second picture shows a 12th century man and woman both wearing bliauts without capes. I won’t ask what she’s doing but it seems “gilflurt” appropriate. A hundred and fifty years later after the Little Ice Age had settled in, we see men and women wearing the houppelande, a high necked, full skirted, very long gown, which is often fur lined as shown in the two pictures, which are very typical. It’s also clear the men are wearing elaborate and warm looking headgear. 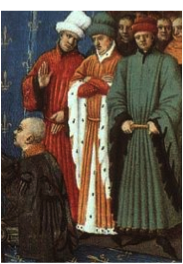 The notion that the weather was a lot worse in the 14th and 15th centuries than in the 11th and 12th does not seem at all far-fetched when you compare these outfits. I’d love to relate Renaissance, Tudor and Jacobean fashion to the changing weather, but since this is a blog post, not a term paper, I’ll move along to the Georgian period. 1670- 1710 was the coldest part of the Little Ice Age overall; temperatures warmed slowly to about 1740 and then rose again until about 1775. The late 17th century was the Restoration period, when that great philanderer Charles II occupied the English throne. 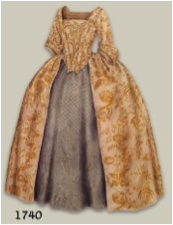 Not surprisingly, after the rigors of Cromwell’s theocracy, and considering the king’s proclivities, the necklines of women’s clothing were very low in this period. However, the rest of the gown was made of multiple layers of heavy fabric, as well as several layers of undergarments. Gentlemen wore long coats, large breeches, and wigs which must have been like having a giant curly stocking cap on all the time. 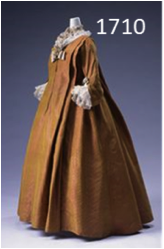 King George I acceded to the throne in 1714 and things didn’t warm up much; the major innovation was the French “saque” a gown that was much fuller, especially in back than had prevailed in earlier decades. 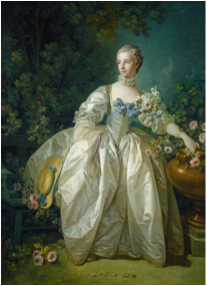 During the reign of George II (1724-1760) fashion changed incrementally, skirts grew wider, the stomacher bodice became popular, and elaborate contrasting underskirts added color and style. Heavy fabrics were widely used and underneath, bum rolls and petticoats added layers of insulating warmth, while the underskirt was often quilted, and sometimes made of wool. The cut and drape of these dresses shows these heavy stiff, fabrics quite well. 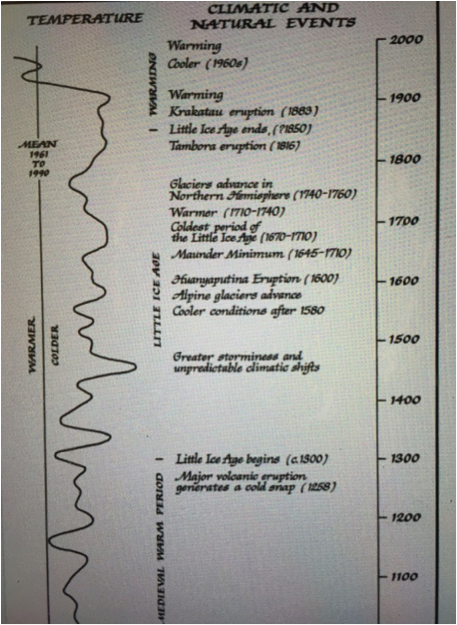 Right around 1740 the temperature started upward and rose significantly until the late 1700s. If we take a look at the fashions of this time, we see a pretty major change. Although the shapes of the dresses don’t change a great deal, the fabrics and construction do. Heavy petticoats and bum rolls are largely replaced by cages and hoops, which hold up the wide skirt but are much lighter than the old heavy petticoats. Fabrics are also far lighter and softer – they look silky, rather than the stiffer, heavier garments of the early part of the century. 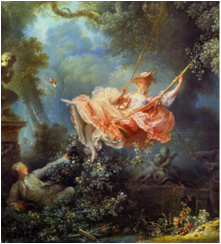 Fragonard’s famous painting The Swing is a useful example, as the gentleman is enjoying a good view of the lady’s legs and undergarments, and we can see that her dress is light enough to puff up as she kicks, and that the petticoats beneath it are not stiff or heavy, rather they exude lightness. Boucher’s painting of Mme Bergerat (like The Swing, painted in the 1760’s) also gives a similar feeling of airiness in the clothing, and notably both are outdoors. These sunny outdoor portraits are also a contrast with the paintings from earlier decades of people wearing heavy clothing indoors. 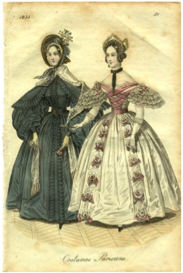 These trends largely continued through the late 1700’s although skirts grew narrower, and an early form of the bustle appeared during the 1780’s. This excellent article says the French Revolution in 1789 “cuts the history of costume like a knife.” Quickly and drastically, gowns grew simpler, narrower and more revealing. Draped shawls replaced long sleeves and thin fine muslins, the sturdier fabrics of earlier decades. 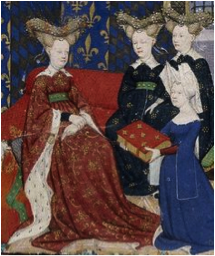 Ladies wore gowns so thin that they wore pinkish tights under them due to the lack of other undergarments. It may be only coincidence that these changes occurred during one of the warmest quarter centuries Europe had seen in five centuries, but they were certainly facilitated by the warmer weather. Of course this extreme simplicity didn’t last long; modistes had a vested interest in more ornamented and costly gowns, and fashion will always move on. 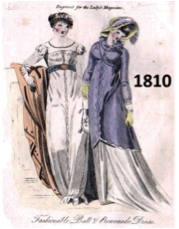 As the early 1800’s wore on, trims grew more elaborate, spencers and pelisses were added for warmth rather than merely large shawls and the silhouette grew wider. Simultaneously, temperatures in Europe were falling, so that by 1810 they were back to where they were in 1750. In 1815 Mt. Tambora erupted in the Philippines and impacted the climate world wide; in Europe and North America 1816 became known as “the year without a summer.” There were frosts in June, very cold weather, a great deal of rain and major crop failures and hunger. This much colder weather persisted for three years or so, and the general cooling trend continued until about 1850. 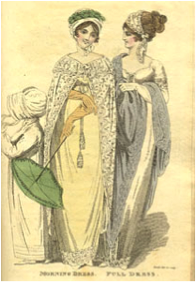 Here is a fashion plate from 1817 which illustrates some of the changes. 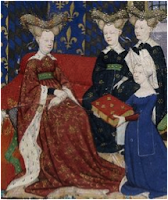 She is wearing an underdress with a high neck, visible under her warm looking, full length pelisse, and over them she is also wearing a shawl. Her hat is large and warm looking. By 1822 skirts were even fuller, and the lady is again wearing a warm looking spencer and carrying a shawl as well. By 1835 (the year of this last illustration), the Georgian era had ended and the Victorian was underway. The increase in the amount of skin covered by women’s clothing is more generally attributed to changing morals than changing climate, but when one considers that by 1850 temperatures were nearly as low as they had been during the depths of the Little Ice Age, it does not seem unreasonable to think that this played a role as well. Helena Keighley, the one who sent the letter, is not the sour spinster Malcolm was expecting, however. She is a beautiful, vibrant and equally headstrong woman who is more than ready to take Malcolm to task for ignoring his duties. As the pair becomes embroiled in solving the problem of the smugglers, a strong attraction develops. The smugglers aren’t going without a fight, though. Will his new neighbor bring Malcolm all the things he never knew he wanted? Or, will the smugglers destroy it all? Find out in The Contraband Courtship. Written content of this post copyright © Alicia Quigley, 2015. Fascinating. I love the idea of tracing a changing climate to changes in fashion. Corsets for both women and men seem to have been essential to maintain the prevailing shape in both the Georgian and Victorian era. However, the idea of heavy and bulky clothes having to do with temperature is contradicted by the fact that the shoulders of the women are almost always uncovered in the evening. A woman could be wearing 25 pounds of clothing and still be freezing because her shoulders and arms were bare. The idea of climate influencing fashion is as good as any for that most illogical and unfathomable subject. Wonderful, informative blog post. Is Mt Tambora in Indonesia rather than the Phillipines? 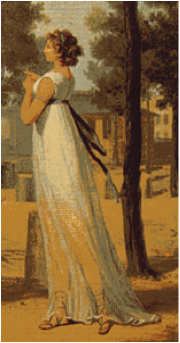 We've had rather a "year without summer" in my region this year, so I sort of relate to 1816. The veg I planted didn't fare so well. Of course, I have the convenience of local supermarkets unlike back then, so I won't go without. Thank you for your comment! I'm glad you liked the post. Corsets were certainly worn by ladies in the Georgian and Victorian period - and men wore them during the regency when ladies corsets were much shorter and sort of like stays below the breasts more than the waistnippers of the earlier Georgian period. The Prince Regent for example was well known to wear corsets. It is true that evening gowns were much less practical. Ah, the things we do for fashion! :) Thank you for your comment! Thank you so much for your comment! I'm glad you enjoyed the post. Mt. Tambora IS in Indonesia and I apologize for this error in my proofreading. Thank you for your comment, Terrylee. It was a fun post to write, too. Best of luck in the drawing! It's been an exceptionally hot summer for me. Like you, I'm ever so grateful for the local market! Thank you for commenting; I hope you have a lovely weekend! Such an interesting angle to look at fashion from, Alicia, I enjoyed reading this. 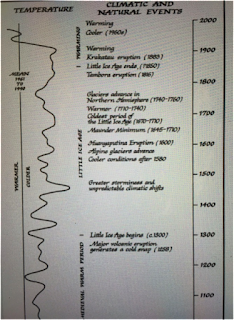 I hadn't been aware of the ups and downs of the Little Ice Age before reading this post. Thank goodness for central heating. Especially with the nights drawing in! Thank you, Rebel. I had a great time researching and writing it, too. I'll join you in gratitude for central heating! I also agree with you, Catherine. It's just starting to cool off in the evenings here, too. Really interesting read Alicia. I am currently working on my dissertation which will be looking to explore how the LIA impacted fashion in medieval England. Your insight into this subject is the only one I have come accross. Any tips or useful sources you can give me would be greatly appreciated. Thank you for your comment; Alicia can be contacted via her own webpage too at the link below, just in case she doesn't spot your comment! Thank you Catherine, much appreciated.